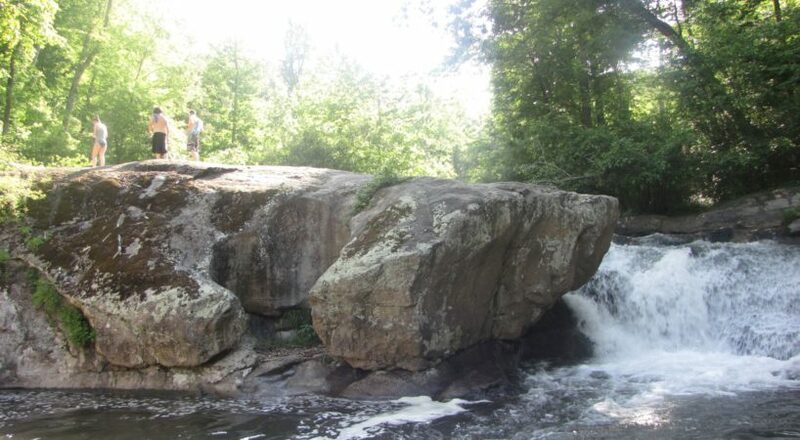 Panther Falls is an extremely popular local swimming hole and waterfall on the Pedlar River east of the Blue Ridge Parkway. 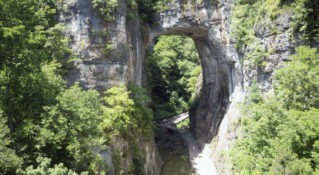 On summer days, the falls are packed with people jumping from the top of the two rock shelves that frame the 10-foot falls. 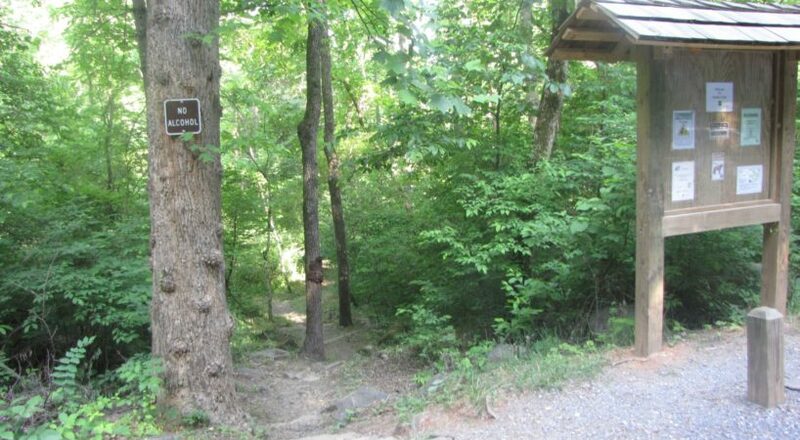 The very short hike to the falls (only .4 miles) offers visitors a choice of a low or high road once reaching the falls. The trail is muddy from being crossed by small streams; caution is advised. An undercut ledge rings the pool and currents can be strong, making climbing out of the water challenging. Use caution while swimming. From the Lexington Visitor Center, drive east on Washington Street to a left at the stoplight onto East Nelson Street (US-60). Continue for 15 miles through Buena Vista and beneath the Blue Ridge Parkway overpass to an immediate right onto a gravel road, Panther Falls Road. Follow the road for three miles before arriving at a clearly marked parking lot for Panther Falls. In the summer, the parking lot is packed until the early evening. If you want to skip the crowds, come early on weekdays or in the early evening. Avoid weekends if crowds are undesirable. Because the trail is muddy, flip-flops are not recommended. Sit down for BBQ at JJ's Meat Shack. Bring out a hammock and a picnic and enjoy the sounds of the calming waterfall and children playing. Up and down stream from the falls are several pools that are relaxing as well. Nearby, just off the Blue Ridge Parkway, is the Cold Mountain Trail, which is also worth a glance for the stunning views it affords. Alcoholic beverages are prohibited in and around the Panther Falls area.